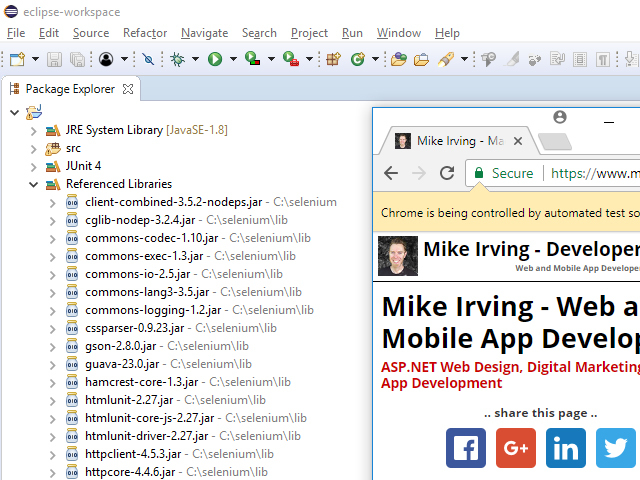 Recently I began looking at using Selenium WebDriver to write automated tests for Web Applications. All sounded great in theory. I was content with using Java to write the tests, and the syntax for the Selenium functionality looked fine. However, I found the proces of setting up a test machine somewhat clumsy, with conflicting guides. This is how I sorted it in the end. I have been using Eclipse IDE, though IntelliJ or Visual Studio would be fine. You want the Selenium Client Driver, for your chosen language, Java in this case. Add External JARs to your project. All from the c:\selenium folder AND the 'libs' folder. Download the WebDriver for your browser. This is where I slipped up for a while, wondering why it wouldn't build. Reference in the first line of your Java program.